In this section, we shall explain the various projects we either visit or engage with on a typical visit to Rwanda. It is a three-centre visit based initially in Kigali, followed by a short stay in Gikongoro and concluding with about 10 days in Kamembe in the far south-west of the country. What we do now is based on the experience of past visits and using the expertise of Jonathan Lamb who is currently based in Rwanda on a 2-year project working with Bishop Nathan and the Anglican community in Cyangugu. Helping him was the most charismatic and charming of local guides called Charles, who also acted as translator for us when needed. Charles speaks very good English and knows Rwanda and its history well. He lightened many moments for us with his wonderful sense of humour. What follows is a summary of our activities in 2013 which will form the starting point for our plans for 2015. We began in the capital city which is expanding and becoming modernised in a remarkable way. We were based at Solace Guest House a modest but comfortable place to stay and the headquarters of Solace Ministries. Under the inspired leadership of Jean Gakwandi, himself a genocide survivor, Solace Ministries has set up projects all around Kigali to support and train widows and orphans of the genocide. Jean has based his work on the call from scripture to ‘Comfort My people’. He has worked really hard to get widows and orphans to come to terms, as best they can, with the trauma of genocide as well as giving them the chance to learn skills which can enable them to be self-sufficient. We visited a training farm for widows, where women learn how to grow, harvest and sell crops as well as how to look after animals. We were warmly welcomed. We listened to and were deeply moved by their stories, and their singing. We got alongside them in the fields, doing some planting and weeding. To be honest, we didn’t do much and we were not anywhere near as skilled as they were, but by showing our willingness to work with them, we demonstrated our solidarity and empathy. This is really important to them. Quite near this spot is a Health Centre which Jean Gakwandi opened with the help of generous donations from Christians in the Isle of Man. The government has been so impressed with the quality of what is being achieved and the dedication of those involved, that they have decided not to set up their own Clinic in the area but to support this one by paying the ongoing staff costs! A real tribute to Jean and how he has brought a vision to reality. When we visited, the clinic was packed with people, documentation in hand, waiting patiently for their turn to receive treatment. Jean is planning to expand the facility confident that the government will continue to provide ongoing support for the staffing costs. Last year we missed the opportunity of joining in the Sunday service at Solace Headquarters because of a delay in our flight from Norwich due to snow. But those of us who have enjoyed this experience previously hope that the 2015 group will not miss it! The Kigali Genocide Memorial centre is another of those ‘musts’ on this trip. The centre has a haunting audio and visual display of what happened to many people in the 1994 genocide.There are also references to other genocides. For us, what strongest memory is the grave where over 250 000 bodies are laid, victims of the killing. Bodies are still being added. The Rwandan government wants this place to be a constant reminder to everyone of the horrors of what happened so that such atrocities are never repeated. This stage of our trip included two more visits, to the Cards from Africa workshop and the government-run Training Farm. Cards from Africa is a workshop which provides work for orphans of the genocide, most of whom are now in their 20s. They earn a good living wage. We sell their cards here locally in the Glaven Valley but they can also be bought online. Every 13 cards sold provide sufficient income to cover a person’s needs for one day. We saw how they began with scrap paper, mulched it in water, filtered off the paper in frames and created A4 size sheets of wet paper which dried in the sun in 20 to 30 minutes. These were used as a basis for good quality hand made cards. The Training Farm is a large complex, with accommodation, where farmers from rural communities come for training in how to make the best use of resources. They learn skills which they take back and teach to people in their locality. Amongst the many projects, we saw examples of making methane from cow manure, growing crops in terraces on hills (Rwanda is all hills! ), and animal husbandry. A trip to Rwanda is never complete without dancing lessons! Rwandans are very elegant and dance with much grace. When we Westerners are given lessons, the effects are not always so graceful. our men learning how to dance! This year, we had a riotous time with the men, in particular, looking ridiculously amateurish as they attempted a kind of warrior dance. The ladies split their sides with laughter. The young couple who trained us gave us a beautiful rendering of how it should have been done. The journey south-west.It took two 20-seater minibuses to transport 18 of us from Kigali. Each of us had 2 suitcases weighing 23 kg each. In them, we had our own clothes, but the cases were filled mostly with clothes, toys and other things to leave with Rwandans. Nine of the ‘suitcases’ took the form of blue plastic boxes which contained water filters, enough to provide safe drinking water for over 5000 people. We actually used one of them to produce our own drinking water! We used another Anglican Guest House for our overnight stay here. This is the area where the Anglian diocese works closely with a Rotary Club in Sussex, who donate money to create a Basket Fund. From this, the diocese lends small amounts – about £50-100 at a time – to people who want to start up a small business. They are equipped to return the loan within 6 months. This can then be loaned out again. There are about 160 local projects in the town and surrounding villages which have been supported this way. Rotarians provide background training in setting up small businesses. Some of us got into 4×4 Toyotas and were taken to villages in the hills to see how the is money was being used. You could hardly imagine more hair-raising drives, at speed over rough and bumpy mud roads, close to precipitous drops over valleys hundreds of meters below us. We hung on for dear life. No chance of taking photos. Some of us saw how water filters were being used. We left a box of 9 family filters here for the Diocese to distribute to remote villages. Others of us listened to people talking about the businesses they had established – all kinds of business from making knit wear, to running small shops, having stalls at market, making drinks to sell etc etc.. We were invited to sample one of the drinks, but declined only for the local priest, a lady, to show they were safe by quaffing a large mug of it! People visiting this site will never forget it. Beautifully located on a hill, it comprises a number of buildings which were intended to become a secondary school. During the genocide, however, Tutsis were given to understand that this would be a safe haven for them.They congregated there only to find that they were easy targets for marauding Hutus who came in and slaughtered them all. There are over 50000 bodies buried here. But the most haunting image is of room after room of lime washed skeletons laid out on slatted tables. A stark reminder of the horrors of what took place in 1994. It is one of those places where you walk through in total silence. 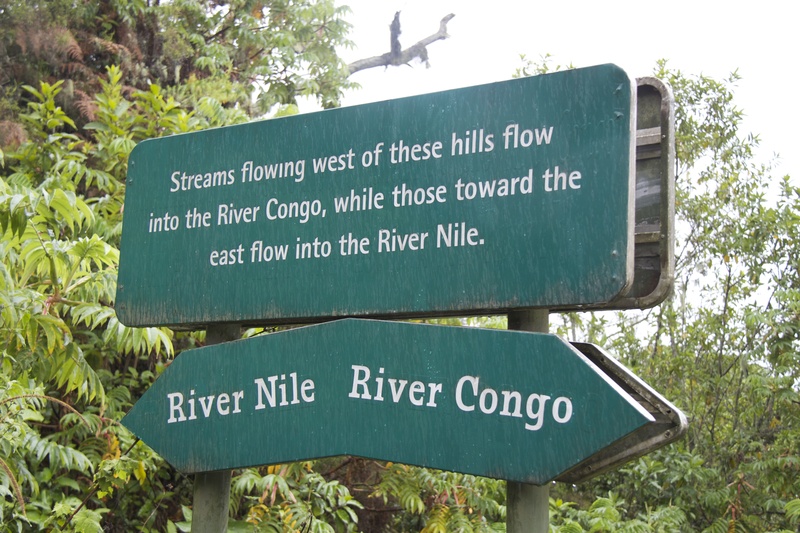 Our road further south-west took us through the Nyungwe Rainforest., where we came across the ‘water shed’ of the Congo and Nile rivers. On one occasion, we also saw a number of Colobus monkeys, swinging from tree to tree. On this road, as on others, you can see broken down lorries, miles form the nearest town, awaiting help. Africans are very patient! Considering the nature of roads in Africa, this one is very well maintained even though it twists and turns and climbs quite a lot. Our destination was the Peace Guest House in Kamembe, where we stayed for 10 days or so. 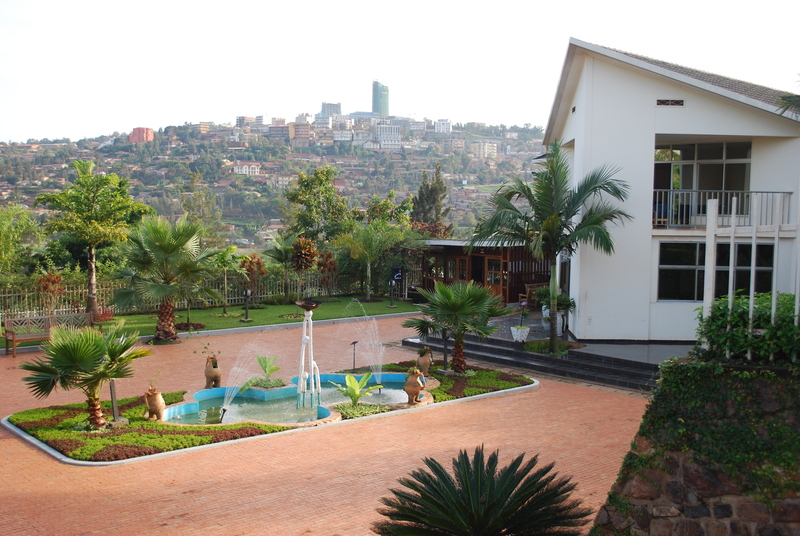 We would probably call it one star but it is beautifully situated on a hill overlooking Lake Kivu. 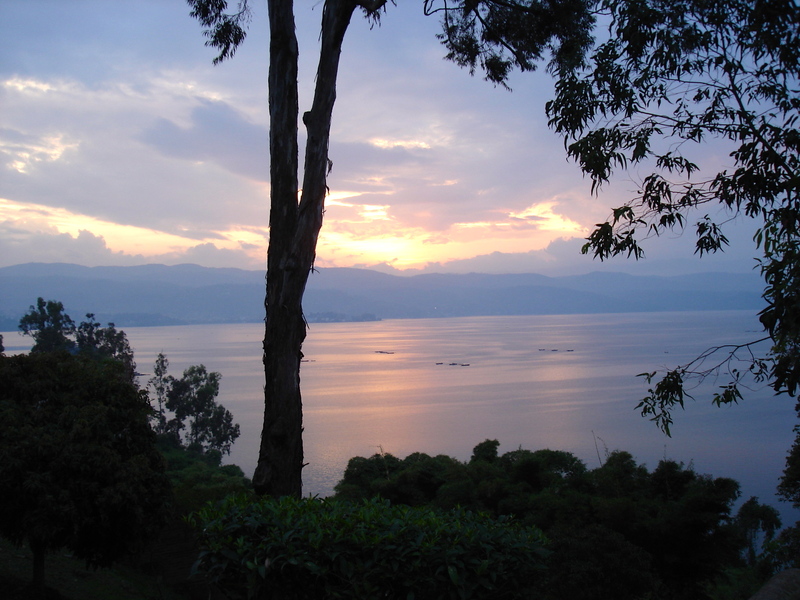 Bukavu in the Democratic Republic of Congo (DRC) can be seen on the other side of the lake. The views from here are stunning. The site itself is on a steep incline, with the bedrooms on lower levels and the dining area at the top. You have to plan your movements carefully so that you are not going up and down too much. At 5000 ft or so, too much running around has you panting somewhat! Adjacent to the Guest House is the Jill Barham Secondary School, opened by Bishop Ken Barham and his wife Jill, to provide education for Rwandan girls. Each day, we enjoyed breakfast on the terrace from which we look over the lake, often hearing the fishermen as they return from a night’s fishing. If they are singing, they have had a good catch! After breakfast, we went off to engage in various activities, sometimes as a group but often we separated off into groups doing different things. We all went to see the weekly nutritional clinic where a large number of children gather to enjoy a drink especially prepared for them. These children come from very poor homes and their diet is poor. They desperately need the additional nutrients which this drink gives them. We taught them the song ‘Thank you Jesus’ and they really enjoyed singing along with us. They were bemused by some of the toys we gave them! They have no idea what to do with a toy. Something else we did as two large groups was to attend local church services on Sunday morning. One of these was held in a village high on a hill some away from Peace Guest House. It had rained a lot and the bus driver could only take us so far. We had to walk the rest – it took one and a quarter hours. The congregation waited for us to arrive before starting the service, which then took 3 hours! We were welcomed by a children’s choir outside the church. The ‘church’ was actually a shell of a building – it had been badly damaged in a storm. But, it was full of enthusiastic people, of all ages, keen to share worship with us. Each one of us, at the sound of a drum roll, had to introduce ourselves. They love to hear our stories just as much as we like us to hear theirs. There was some wonderful singing, accompanied by actions which gave vivid expression to what the songs were about. They have no hymn books, nor Bibles. This is how they convey the gospel message. One little piece of drama showed a crippled child going to the back of church and coming back whole, having met with Jesus! An extraordinary piece of acting. To begin with, we thought the boy was actually crippled! When there was congregational singing, the pastor, dressed in proper Anglican cassock and surplice, was dancing around just like everyone else! When you are in a service like that, all our British reserve goes out of the window – it seems absolutely right to express your faith just like they do! The other half of our group went to the Cathedral service – equally lively, in a brick building with corrugated tin roof. Not like Cathedrals in the UK but compared to churches there, quite smart. On a previous occasion, some of us went to a wedding there – actually 2 simultaneous weddings. Very colourful, vibrant and with typically African singing, but the clergy looked just like ours! We did some work at both Church schools. The Jill Barham Secondary school has many children orphaned by the genocide. These receive grants from the government for their education. The others pay for their education. Set up as a 14+ school, there are many there who are married and some have children. Such is the importance of education to them. Our main role here is to help them with English which has superseded French as the official language. We decided to do this by getting groups of them to attend after-school sessions where they decorated T-shirts which we had taken over for them. We aimed to conduct the session totally in English. It took a while for them to have the confidence to even put one mark on the shirts – afraid to make mistakes! But we all had lots of fun and they treasured the T-shirts afterwards – in a poor country, these are like gold dust! Towards the end of our visit, we were invited to their weekly service. What a service! From a total of about 700 students, there must have been 500 there voluntarily. Four choirs sang for us, each from a different church denomination represented in the school. They danced to congregational singing and a good number of us danced with them! You have to see the video clip to really appreciate this. We did rather more at St Matthews Primary School as we worked within their school day. In Rwanda, children receive free education up to the age of 12. They are used to teachers writing material on the board for them to copy down and learn. We had to modify our approach when we discovered that the class sizes were nearly 70! We tried to introduce activity and interaction to their learning. We sang songs like ‘Heads, shoulders knees and toes’, ‘The horn on the bus goes..’ to help them with their English. They made decorated angels from cardboard plates. We read about 2 football teams – the Reds and the Blues – from one of the Big Books from the Oxford Reading Tree series and encouraged them to do some drawing from it. They love football and know a lot about our Premiership teams. They loved this! We had a lot of fun preparing material for these sessions in the evenings – even those of us not actually taking part did our best to help! We had taken over a coloured parachute to play the parachute game with them. Excitement? There is nothing to match the noise and energy which went into this activity. We left the parachute with them. We also left paper, pencils, boxed games and something rather special made by one of the group. It was a shield with the national emblem of Rwanda on it. The Nursery Class treated us to a rendering of an elephant song with actions in full uniform. It was very moving to see this particularly as we could see the town of Bukavu in the Congo in the background. We were aware of how different that country was in so many ways. We spent quite a bit of time with the Mothers Union which is very active throughout the country and has done a huge amount itself to help Rwandans recover from the effects of the genocide. We met a group of them at the Cathedral , shared a service with them and taught them our signature song: ‘Thank you Jesus’. One of the lady clergy talked to us about what they do to give work to local women. The Mothers Union runs a workshop where they make clothes – you can be measured up and have a shirt, pyjamas or a dress made up for you. But first, you have to go to the market to choose the material. The material looks wonderful in that context but some of us have found that they don’t quite ‘cut it’ over here! They also make uniforms for the children. The photo shows a school jumper being knitted. The Mothers Union does a lot to support local families and we had an opportunity to visit some of the homes. Getting to these modest mud homes was quite a challenge. Our minibus could only take us so far. After that, we had to walk down steep-sided muddy slopes to reach them. Once there, we were given a wonderful welcome. We heard some of the very moving personal stories of the women we met. Grace was looking after her step sister, three half brothers and a sister. Her mother had died of AIDS. Most of Ainarta’s family had been killed in the genocide. After this, she thought a soldier loved her and had his child, only never to see him again. She was now looking after her sister’s children. She had had counselling from the church to help her and they had encouraged her to start her own business as a mobile hairdresser. Whilst part of the group worked in the schools and visited homes, Claude ably assisted by Edward Hackford, conducted some training with 12 local Anglican ministers based on the African Bible Commentary the same as those used in the Congo (see ‘Our Story’). We arrived in short-sleeved shirts and light casual trousers as we were used to wearing out there only to find our trainees all wearing their clerical collars and suits! Here again, we used a worksheet based approach to help them learn for themselves. We wanted them to be in control of their own learning knowing that they were used to ‘top down’ didactic teaching. Because of the history of Rwanda, we found that some chose to work with English commentaries whilst others preferred French ones. Either way, they entered into their studies with great diligence, patience and joy. They treasured their commentaries and loved working together. Coming from scattered communities, they hadn’t had many opportunities for shared learning of this kind. One of them lived and worked in a village in the hills. He had to walk for 7 hours before he reached a road where he could find a motor bike taxi to bring him to Peace Guest House. There happened to be another training session, more like a conference, taking place at the same time. Most of these delegates arrived on the back of a lorry! There must have been 40 of them! Economical. Effective. In Rwanda you use your initiative to get places! 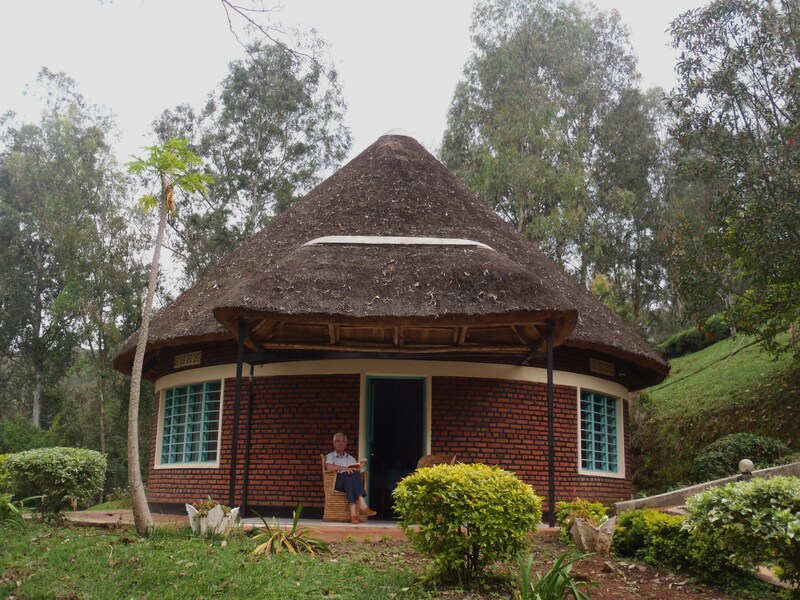 Peace Guest House is only a short distance from the Rwanda-Congo border. You can easily see Bukavu on the other side of Lake Kivu. There are pastors in Bukavu whom Claude had met on his visits to Congo and whom we had begun to support by taking over water filters. They could get to us quite cheaply by motorcycle taxi. They often joined us for breakfast! We wanted to present them with boxes of water filters, clothes, books and other gifts, and did this one day in what turned out to be quite a moving occasion. Rev Ebongya, the leader of the church group, told us how they had been able to use the filters we had given them. He listed out the names of 9 villages, one of which was Baraka, where Claude had lived with his parents as a boy! He also said that one community filter, costing us £200, was sufficient to provide safe drinking water for a village of 300 families. We get these Aquafilters from The Safe Water Trust, a non-profit making company based in the north of England. We had so much support locally that we took out enough filters to serve over 5000 people. Some went to Congo. the rest to Rwanda. In fact we used one for our own supply of drinking water before leaving it with the local people. It was actually quite important to demonstrate to them that they were safe and reliable. Having made the presentations, we needed to get everything to the DRC border. We loaded it all into our minibus for the short journey, but the driver refused to drive it into the ‘no man’s land’ between the two countries. He was afraid of the Congolese. So we had to negotiate porters to take the goods to the 4×4 belonging to our Congolese pastors. This was a drama in itself! Ethne worried that we might never see the boxes again! However, all went well and after much huffing, and puffing, pushing and cajoling, the pastors managed to squeeze everything into their vehicle. They were determined not to leave anything behind! But then came another snag. Their car wouldn’t start. The battery was flat. This kind of problem didn’t surprise us – we were in Africa after all! So we rallied round, found the money for a replacement battery which was amazingly available from a nearby car accessories depot on the Rwandan side. It looked just like KwikFit! With the car full to the gunnels, our friend went off happily. We have heard since that these filters have been used wisely and that the levels of illness have reduced already. At the end of each day, we spent time together as a group reflecting on what we had experienced during the day. We came to value this time enormously. Quite often, we had done different things, and it was good to hear what the others had been doing. More importantly, we had frequently been deeply moved by what we had seen and heard and needed to talk about it, to share our feelings and reactions, and to think more deeply about the issues that arose. We concluded these sessions with a Biblical reflection and prayer. We got to know the staff at Peace Guest House really well. They are all so friendly and helpful. At the end of our time there, they presented us with a cake they had baked for us. The text on it comes from Isaiah 52: ‘How beautiful upon the mountains are the feet of the messenger who announces peace’. We were so moved by this. We were sorry to leave them. But then, some of us are planning to go back………! We had come down to the south-west of Rwanda by coach but we returned by air on a domestic flight from Kamemebe to Kigali. This was an early flight and allowed us the best part of a day in Kigali exploring the city a bit more before catching our plane home . We were able to visit the ‘Hotel des Milles Collines’ where many people had found refuge at the height of the genocide. The story of the hotel’s role is featured in the excellent film ‘Hotel Rwanda’ – a graphic but harrowing account of how the horrors of the genocide affected individuals and families. Very realistic and not for the faint-hearted. There were two shocks for us when we arrived back home in the UK. First, the cold! Second, the culture shock between their poverty and the wealth and abundance we enjoy. But we discovered how content people can be with so little.